We recommend you to visit a Church monument in the Rokytnice nad Jizerou - Church sv. Michala and the chapels of Rokytnice. The hill Stráž (also called Strážník), is one of the guarding hills used in the past to warn surrounding villages of a danger of enemy's invasion. 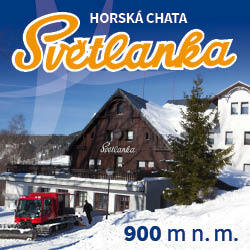 The mountain chalet Dvoračky lies at the altitude of 1.140 m a.s.l. between Lysá hora and the mountain Kotel at the crossing of tourist trails Dvoračky – Rokytnice n. J., Studenov, Harrachov, Mísečky, Špindlerův Mlýn, Rezek. Further, along Dvoračky, one of the oldest trails goes uphill. It is called Česká and was already known in the 10th century. An important tourist crossing from which the trails can take you for example to the chalet Vosecká bouda, Rýžoviště, Harrachov, Studenov, Dvoračky, further to the Labe spring. In the past, the Huťský waterfall was a sought-after trip destination. There was a restaurant here, in which hoedowns took place every Sunday. The Lower Square is built in the centre of Rokytnice nad Jizerou. Its construction was finished at the end of the year 1998; it is thus a new modern object with nice architecture, which does not disturb the style of the Giant Mountains' chalets at all. In the upper part of Rokytnice nad Jizerou, in a great place for a recreation centre of the biggest ski area in Bohemia, an urbanistically perfect self-sufficient square was built in 1996. The square is formed by 11 four-storey houses lined with an arcade with shops, restaurants and other services.